A generous breakfast topped off the refreshing night James and I had had in the Hotel Dreizinnenblick. In bright sunlight, we stepped outside and crossed the road. Pretty much all day we would be hiking on the wide mountain bike route without major inclines or declines. After the tough first days, that was supposed to be easy on our knees. Before even starting our hike for the day, we stopped and admired the Tre Cime di Lavaredo in the golden morning sun. 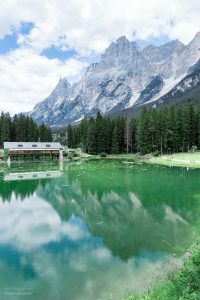 The smooth surface of Lago di Landro made pretty reflections of the surrounding trees. It was not long after we had walked the first few minutes on the wide, sandy path, when we had a first stop. 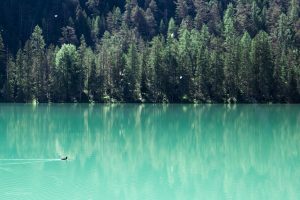 The emerald coloured Lago di Landro looked stunning. The smooth surface reflected the surrounding trees in the morning sun. Majestic mountains rose into the air in the background. Along the way was little shadow despite the trees lining the path, which followed an old rail line. There were only tiny inclines and declines on that track, making it easy to walk. Never far off from the road, we heard and saw cars for the first time in days. 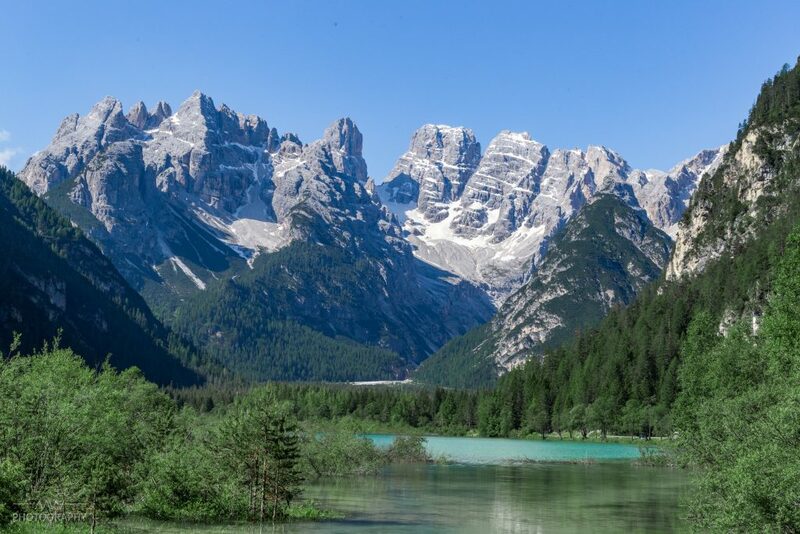 Majestic mountains were rising behind the emerald coloured Lago di Landro. We passed along a little restaurant, to other small lakes and always along woodland. The sun cast a beautiful pattern of shadows onto the ground. It was a peaceful day. 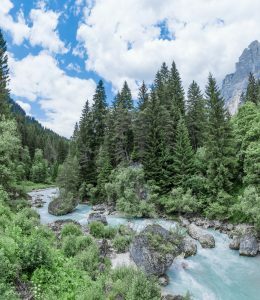 Originally we had planned to hike to Cortina D’Ampezzo and then head up to a rifugio in the mountains around Cortina. But it didn’t get to that. Having felt them for a while already, James’ knee decided that it no longer was up for walking. We were forced to stop. Before I had cursed the road next to our path with all its noise, now I was glad the it was there. We had seen a bus on that road before, so we looked up on a map where the next stop was. Luckily, it was only 300m away. Slowly, we headed up to the road and looked at the timetable. The next bus was in 2 hours. With nothing else to do, we sat down in the little shelter at the bus stop. 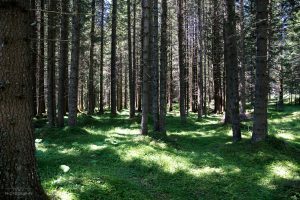 The sunlight made patterns of shadow and light on the forest ground. While waiting, we rearranged our plan. There was no way we would make it up to a mountain hut with James’ knee hurting. Instead, we managed to find a hotel in Cortina D’Ampezzo with a vacant room for the night. The day after, we had planned to stay in a hotel in San Vito di Cadore anyway, and there was a bus from Cortina to San Vito. That would give some rest for James’ knee for a start, but we weren’t sure about the rest. 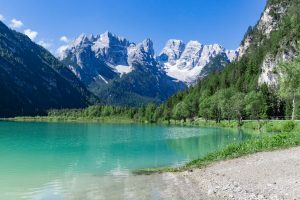 On our rest day, we slowly meandered aorund the little Lago Mosigo in San Vito di Cadore. To be honest, these unexpected events dampened my mood quite significantly. I loved being in the mountains so much, I hardly ever was in the mountains and now we had to stay in the valley for a bit. I was a bit worried about James though. The last thing I wanted was having his knee permanently damaged. The bus came, we slowly tackled the sort walk to the hotel and then we just relaxed. In the evening, we went to the pizzeria just next to our hotel. It was the first time we ate real Italian pizza, and it was great. Thin base, delicious toppings. Over dinner and wine, James came up with an interesting suggestion. His knees certainly needed 2 or 3 more rest days to not risk a bad injury, mine were just fine. He insisted that I head off by myself to do the route we had planned following San Vito di Cadore. Hesitant at first, the wine and his insistence finally overpowered my bad conscience for leaving him alone. I agreed. Somewhere around, we also came across this little river. 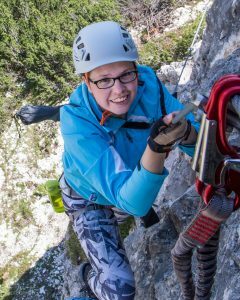 The next day, we took a bus to San Vito di Cadore, checked in to our hotel and the slowly walked around San Vito a little. We meandered around Mosigo Lake and around the town a little, before resting. We did not want to push James’ knee. Instead, we discussed my plan for the next days on my own. In the evening, we enjoyed yet another real Italian pizza and some wine. Italy definitely does deserve the description “food capital of the world”. Their food and wine are superb.